Would zip ties — like here at an Albany show — be enough to secure rifles under Initiative Proposal 44? In the debate about gun control, it is worth remembering what the Oregon Constitution actually says, and then check what the court has said it means. Two initiative proposals are in the works. No. 43 would ban the sale of the most popular semiautomatic rifles and handguns, labeled “assault weapons” in the bill, and magazines holding more than 10 rounds. People who already own these items would be barred from using them except at ranges and would have to register them or be guilty of a felony. The other proposal, No. 44, among other things would require firearms to be locked away, which most people already do, or stored with trigger or cable locks. The opinion confirms that in its historical context, the Oregon right is meant to protect liberty against government oppression — oppression through a standing army, for instance — while also protecting a citizen’s right to self-defense. Today, the term “assault weapons” covers rifles commonly used by people engaged in “military defense.” So ownership and use of those rifles by citizens for lawful purposes would seem to be protected, according to the court in Kessler. The court will face that issue if Initiative 43 becomes law. “Assault weapon” means what you want it to mean. It’s an emotional and non-technical term. And for those who want restrictions, it’s a dog whistle. We’ll stated! The ant-gun crowd will continue to push regardless of the constitution! Citizens best push back by not signing petitions and contacting the legislators to follow the law! If a person can’t be trusted to sell them a firearm, don’t restrict everybody’s gun rights over it, they can’t be trusted! Restrict them! Put untrustworthy persons in a lockup, institution or under adult supervision. Somebody should at least sign for them, becoming responsible for what they do. Don’t take my gun rights away because you’re afraid of untrustworthy people! Every man from my son to my great grandfather has served in the military and we learn firearm safety early. Maybe people should consider taking their ten year olds to firearms safety classes and having their nutty relatives locked up. Excellent article Hasso. The problem with the left anti gun crowd is… They don’t care. They want to pick and choose what parts of the Constitution to keep and have decided to toss out the 2A and Oregon Article 27. Our Oregon leftist politicians seem to be in agreement. Well it has been obvious for some time that your (not my) gov. and legislature don’t know or care what the const. of the state or nation say. It’s encouraging to see the thoughtful and intelligent responses to this article. 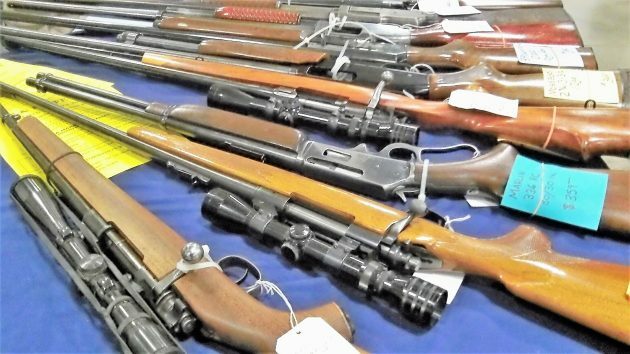 Responsible gun stewardship by serious citizens is as important now as it ever has been. First, my handle reflects my politics. In the West, firearms are tools with a specific purpose. Worked with an outdoorsman with 40+ arms. Rifles in various calibers, shotguns in various gauges and choke, depending on the game and terrain. None were autoloaders. He felt that, if you needed a second shot, you shouldn’t have taken the first. The Bushmaster/AR15 is a cool piece of weaponry, but has no civilian purpose. The anguished wailing that some folks put up over arms control seems like unreasoned pseudo-religious response. Oh, BTW, there’s not an auto-loader in my tool collection either. “It is not up to you to decide what a person uses period!! Please note that I made restrictive comments on ownership. Self-defense is a very good reason for a semi auto rifle. Seems simple to me. Well I guess that settles it. Since your friend said he didn’t need an auto loader that means no-one does. What a magnificently ignorant comment, and grossly feeble attempt to play middleman peacekeeper. So us a favor. Stay home on election day. Did you even read the article centrist, or Article 27 of the Oregon Constitution. You are talking about using a gun as a tool. The gun is specifically protected as a weapon for defense of self and state, a purpose which ARs and other targeted-guns serve well. Coyotes often come to a call in pairs or packs. Ducks come to decoys and calls in flocks. Semi-auto rifles and shotguns have their place in hunting. In a home invasion by three armed suspects do you really want to be defending your home and family with a 3 round, bolt action rifle, or a 6 shot revolver? I don’t. So yes, there are indeed reasons for civilians to own semi-auto firearms. One response to centrist: What are your qualifications to determine that a Bushmaster/AR15 that has no civilian use? This has been my question all along but no one seems to want to give their qualifications as to the civilian purpose or for that matter, what any one needs. “Need” is not a part of the deal. Free people determine their own reasons for owning anything. Personal qualifications? None likely acceptable. Consider this– how many civilians need a weapon (not the NRA PC sporting arm) intended to take an enemy at center-of-mass (aka gut shoot) in order to present more targets? Consider this — use of this device, except on a controlled range or in active combat, violates the 10 commandments of firearm safety. I didn’t know that one could stack nonsense that high. Note that in Article 1, Section 8, Clause 15 the US Constitution lists the three duties of the Militia of the several States. One of these is to repel Invasions. (the 1776 Virginia Declaration of Rights defines the Militia as being composed of the body of the people trained to arms) Article 1, Section 27 of the Oregon Constitution lists defense of the State as one of the reasons the people shall have the right to firearms ownership. In his 1832 Commentary on the Constitution Justice Joseph Story calls the right the palladium of liberty and postulates his opinion that it offers a strong moral check against the usurpations and arbitrary power of rulers. All of these are reasons that the AR-15 platform and the AK-47 are perfect for the people to perform their duties as free citizens. Let us review. “ASSualt” weapons were banned in 1994 as a part of that Law Enforcement Act. Expired in 2004. Since then they have been readily available. Available for mass shootings. Injury. Death. Disruption! Tears. Pain. Suffering. Burials. Sadness. Some reading offers that mass shootings have increased 200% since the expiration of that assault weapon ban. We have all witnessed (on TV) several of these events lately. Why do those with “gun fetish” insist on this style of death trigger be legal? Continually? Further more, please offer a salient point that they apply to our 2nd Amendment. Good luck. I look forward to reading. ASSult is an action not a weapon. Civilians rights shall not be infringed. The ban was from 1994 to 2004 not 1900 to 2004. The statement is misleading and dishonest. The anti-gun crowd cannot construct a viable argument without lying. In 1775 the most advanced rifle in the American Colonies was the American Long Rifle. AKA the Pennsylvania Rifle and the Kentucky rifle. It belonged to the farmers and frontiersman that lived in the colonies. It far out performed anything the British had. So what is wrong with American’s owning weapons that are not the equal of our police? So, our Oregon Constitution says “Protestants” can bear arms. I guess Catholics (who were banned from the state by our original constitution…also Chinese people and blacks were banned, and Native Americans were chased out or shot) and those who are not religious or follow religions other than Protestant don’t have the right to bear arms in Oregon..
Whoopee! Thanks, Hasso. Finally maybe we can get a foothold and only have Protestants owning guns without proper regulations and kids can feel safe again in their schools because you have to be a Protestant to have the right to have any gun you want..
It’s a start, but probably the most ferocious gun nuts are Protestants, so back to square one. You should try reading the Oregon Constitution before further embarrassing yourself. It says no such thing. Off to the side, but I gotta say it. My Dad objected to the use of “gun” for a rifled bore under 6″, they were rifles. That was his WWII training. First off I would like to say that I do fully support my local law enforcement. I appreciate what they do. So please don’t take this as bashing law enforcement in any way, just an observation. With that being said, why should I not be allowed to own the same firearms that they do? The people that support these kind of laws want to say that there is no legitimate reason to own a AR. Is there a legitimate reason that the Albany police have an AR in every patrol car? This petition is poorly written and way overreaching. As a gun owner, I’ve always felt Oregon has done a reasonable job with gun legislation. As we experience another horrific incident involving the illegal and immoral use of firearms, I believe the firearms community of collectors, hunters, shooters, and merchants must be proactive to provide a reasonable solution to prevent firearms coming into the possession of evil, mentally ill, or destructive individuals. Otherwise we must be prepared to suffer the consequences of a rabid antagonistic group largely supported by the media. For the purchase of any firearm with a detachable/reloadable magazine capable of holding more than 10 rounds, a person must provide two character references in addition to a background check. The references, also, should be subject to a background check. Furthermore, it should be clear that providing a false reference that the potential purchaser is a reasonable, stable, mature personality would bear equal culpability with the purchaser if the firearm is used in any criminal activity. Regrettably the infrastructure to manage this scheme would be onerous, time consuming, and frustrating to many. A valid set of references should be in good standing for some period of time, less than a year. Firearms such as revolvers, most hunting rifles, most shotguns would be exempt from such restrictions as there are rarely involved in hurting multiple victims. Furthermore, the cost would have to be borne by the purchasers of firearms either directly or through a fee imposed upon the sellers. Undoubtedly, there will be means for some people to circumvent this arrangement but it should significantly reduce the number of “wrong” people obtaining the most damaging firearms. My colleagues will likely despise me for this suggestion but the blood is hot among the ignorant and domineering liberal masses to say nothing of the “media”. The “media” has a vested financial interest in being able to manipulate the public and few are willing to take an independent and educated view of matter. Legislative remedies are not going to effectively address the sociological illnesses that are the cause of mass shootings.